Every once in awhile, things shape up so that a certain week brings a host of good books. Fittingly, the Wednesday before Christmas marked one of the strongest releases of comics this year. -I thought this might end up being one of the best of the pile, but it was actually a good appetizer. By that, I mean it was thin, light eating… er, reading. The story starts with Wolverine in half. 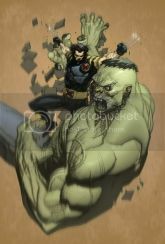 He slowly recalls how this came to be, (a poorly written) Nick Fury sending him after a Hulk SHIELD recently realized was still alive, the fight beginning, and Hulk tearing Wolverine apart at the waist. But, we don’t see much else from the battle. Maybe it would’ve been more epic if I hadn’t seen a million previews of Logan halved. -The Winter Soldier saga continues. This is one of those gasp issues, where all the characters sort of take a second to prepare for the next big battle. Not that it’s bad, just not one of the memorable issues of Brubaker’s strong run. -This series may yet be great, but it hasn’t risen to that level yet. Maybe it’s that, as a newspaper writer, I know that world, but I struggle to buy Sally Floyd’s journalist character. The ending of mutantdom is a landmark event, and deserves to be marked with great writing. For that, see the new X-Factor. -Another “Decimation” storyline that’s plateaued at the “good but not great” altitude. OK, nobody’s too fooled about Krakoa as a villain, though there still may be some twist coming. Little things, like how poorly Beast is drawn, and how for some reason Nightcrawler knows exactly what plane Sean is on, detract as well. The bonus stories are interesting, though I’m still curious what they’re building to, if anything. -The Ruin storyline concludes. Strangely, the penultimate issue (in which Mr. Mxyptlk bites a kryptonite arrow) was far superior. This issue is fine, and ties up the last big pre-Crisis Supes tale. But it doesn’t feel that important. And the attachment of Ruin to the Crisis (he refers to his “employer” as bankrolling the anti-Superman effort) is not played up well enough. -I was rabidly converted to DC by the buildup to IC. It was marked by strong writing, smart plots and the ongoing intrigue of the Crisis placed subtly but well. So far, the series itself has been disappointing. 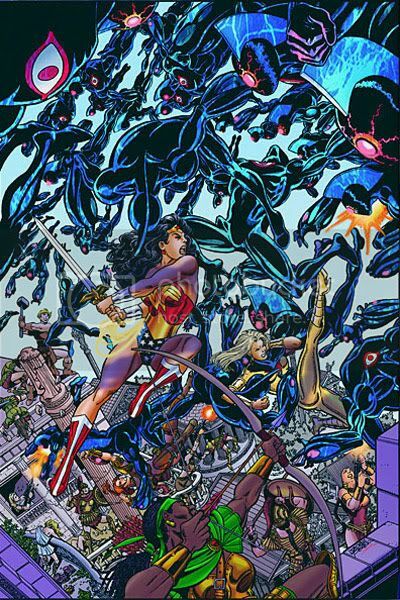 This still is a good read, but it’s too busy and confusing (how did the Amazons disappear? What the hay is going on in Atlantis? Why are some heroes in space? ), the chief culprits behind Crisis on Infinite Earths not living up to its potential. On the positive side, at least Jimenez didn’t draw Power Girl like a female bodybuilder this issue. And, I didn’t expect the Alexander Luthor heel turn, so that was a cool surprise. Is Darkseid still behind all this? Guess we’ll see. -I like how Powell can change the pace and put out an issue like this, more serious (but still ridiculous). His art is more somber, relying more on pencils, to accomodate that feel. It’s also almost worth the cover price for a very funny letters page. I wrote a review of some Christmas-y comics for my “real” comics-related job, so I thought I’d post a few thoughts as we’re nearing the big day. This year’s Marvel Holiday Special was pretty entertaining. The first story is a silly Moleman tale, and brought out a few chuckles, but little more. The second story was an Ultron reprogrammed to act as Santa by a young girl scientist. But it goes evil again and tears up a New Avengers Christmas shindig. There’s a running gag where the heroes are trying to get Spider Woman under the mistletoe that’s pretty funny. And Gravity tries to join the party, but nobody lets him in because they don’t recognize him. The last story is a sort of Dickensian tale of a villain robbing to get presents for his children. It didn’t work for me. DC had a few books, mostly the ones attached to Cartoon Network shows. They’re good for stocking stuffers for kids, I suppose, but only the Justice League Unlimited is worth a read. Image had a holiday book that was just too steeply priced for my taste. I noticed most of the holiday titles were priced above normal rates (aside from the aforementioned kid books by DC). I could make some commentary on the true capitalistic meaning of Christmas, but I think we’ve all heard that one before. If you’re a comic book fan today, chances are you’re really into Infinite Crisis. It’s the biggest and best thing going in superhero comics right now. If you’re not reading it, you should be. The thing is, there’s so much going on right now that’s seemingly unrelated. That’s where this series of articles comes in. 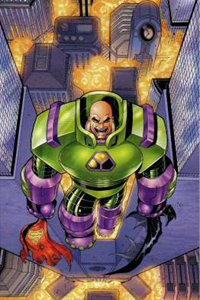 So is Luthor just crazy, or does he have inside info from somewhere? When Amanda Waller, one of his confidantes, questions Luthor, he tells her, “I wouldn’t argue with the source.” Wait a minute, there’s someone Lex Luthor wouldn’t argue with? That’s got to be one bad dude. Luthor’s words also bring another question to mind: does he mean the source of the information, or the source of the asteroid? “Darkseid has always been my ally. Technology is what moved this country leagues ahead of the rest of the world–the universe. And Darkseid offered whatever I needed as President in that regard. Darkseid offered “whatever” Luthor needed. The asteroid was just that. To finally defeat Superman, Luthor needed people to believe that their deaths could be caused by the hero they admired above all others. “If mankind has one common emotion…it’s fear. Fear of the unknown. Fear of what they cannot control. And look how ready they are to believe that you are the thing they fear the most.” And just for fun, Darkseid threw in a bonus. 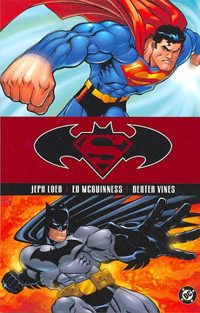 Superman/Batman: Public Enemies was originally published in issues 1-6 of Superman/Batman, written by Jeph Loeb with art by Ed McGuiness and Dexter Vines. It is currently available in trade paperback format. What’s bigger than an alien invasion? Nothing calms down the anger of waiting an extra month for a comic than finally opening it up and finding that time went into making one of the balls-to-the-wall best issues ever. Buy Ultimates 9. Every page, every frame is worth the price. This is a series that is unafraid to do things as big, bad, reckless and fun (or sometimes not so fun). It’s the Avengers on steroids and acid and a few cups of coffee. How remarkable is it that the big reveal of who the secret villain is came as little surprise, and that did nothing to dilute the enjoyment of the storyline. Who gives a crap if you know who the bad guy (lady) is? The world’s still about to blow up. Imagine feeling that excited about the other Avengers book (no, not Young Avengers). World War III has never been so fun. Well, it was done in possibly the least meaningful way, in a storyline that probably was thought up in a five-minute “Oh crap, Spidey sales are lagging and House of M is over so what the heck are we gonna do?” session. Check out the last splash page of Friendly Neighborhood #3. Iron Man carrying his fallen friend off into the sky. Great. That’s really touching. You know, because there’s all that emotional history between Peter Parker and Tony Stark and everything. I remember when Superman died, and maybe it still was a big marketing deal, but at least it was well done. Also, Supes stayed six-feet down for a few months. I’ll be surprised if the web crawler isn’t web crawling again next week. Funny thing is, it wasn’t that bad of an issue.